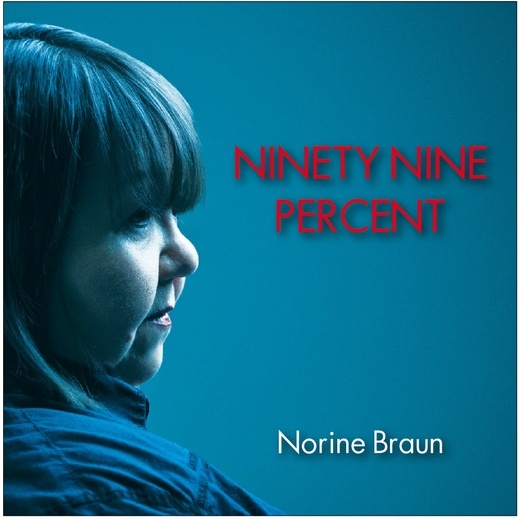 Independent Vancouver artist Norine Braun releases a new single, Ninety Nine Percent. The gritty, progressive sound of 99% has edge, sonics and is full of adult alternative hooks that AAA audiences understand. Braun recruited a killer collection of local roots rock, soul and blues players for the single and upcoming album including: Juno nominated producer/guitarist, Adam Popowitz, drummer/percussionist Elliot Polsky, blues harpist Andrew “Huggybear” Huggard and pianist Alice Fraser. Using 99% as a muse, Norine is currently writing the material for the next album due out in 2013. Following on the heels of last year’s release No.8, Braun intensifies the moxie with 99% giving more than a nod to alternative feels and urban blues, a la Black Keys, Kings of Leon and The Pretenders. The song pays tribute to the unifying slogan of how the 99% are paying the price for the mistakes of a small minority. Braun has pledged 1% of the net profits of 99% to be donated to a non-profit organization dedicated to saving the planet. Hard working DIY indie artist Norine Braun has an impressive and prolific catalogue of 8 albums. The recipient of awards like Songs Inspired By Literature international songwriting competition and the prestigious ‘Female Singer-Songwriter of the Year’ at the Independent L.A. Music Awards, Braun, even as a newcomer, has dazzled her critics as “a rare find,” according to The Best Female Musicians Magazine. Reached 100th in Best of Country chart in 2015. In the top 100 for 1 week. Reached 97th in Best of Country chart in 2014. In the top 100 for 2 weeks. Reached 92nd in Best of Country chart in 2013. In the top 100 for 4 weeks.